This page of the website will look at articles associated with the discrimination individuals with Down syndrome receive from social media outlets. People do not just receive their information from videos, but also from news articles that are continuously circulated through social media interfaces. This opens a whole new window for discrimination. Every time an article and video are shared on Facebook it allows a whole new fraction of people to comment. The person writing the comment has the choice whether or not to discriminate against individuals with Down syndrome or praise them. son. There was no threat being sent to anyone viewing these images, nor was there any hateful speech presented in any of the photos. The Special Olympics is not a violent organization. This organization provides athletic events for individuals with disabilities to participate in and receive awards. By no means are these photos showcasing an act of violence to the viewers. Diana is unsure of who flagged her photos, or if anyone running the site looked at the photos before flagging them (Chew 2). Diana feels that this is an act of discrimination against her son (Chew 2). This article was circulated around Facebook 2,850 times and tweeted about 178 (Chew 3). A petition was started and circulated around Facebook entitled Tell Facebook:Don’t Censor Photos of Kids with Disabilities (Chew 2). This petition was signed by 22,563 members of society (Chew 2). This article shows how social media can be both discriminatory and a good source for circulating news. 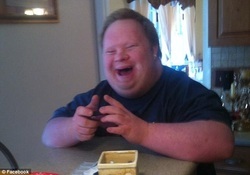 Robert Saylor was a twenty-six year old man from Fredrick, Maryland who had Down syndrome (Vargas 1). His story was circulated through Facebook 22,000 times (Researched By Vargas 2). Robert was attending the movie Zero Dark Thirty on January 12th, 2013 with his aide (Vargas 1). After the movie had ended the aide stepped out to go retrieve the car. Little did the aide know that when he or she returned that three off-duty police officers would be pinning her client to the ground (Researched By Vargas 1). It would later be ruled Robert died of homicide by asphyxiation (Vargas 2). The three off-duty police officers from the Fredrick County Sheriff Department were Lieutenant Scott Jewell, Sergeant Rich Rochford, and Deputy First Class James Harris (Vargas 1). These men were on administrative leave without pay and upon investigation were reinstated and found not guilty (Vargas 2). The same police department these individuals work for performed the investigation (Vargas 2). Social media took this article that was first presented on the news and spread it across social media interfaces, informing millions of people who would have never known about this man. Individuals using the social media website Facebook turned this story into something much more discriminatory than it should have been. Many users praised the police officers for what they did and provide prayers for them (Researched By Vargas 2). By these users showing their praise for the police officers they are discriminating against Robert. They are glad the police officers did what they did. Some people stated that people with Down syndrome should not be allowed out in public (Researched by Vargas 2). Robert has the same rights and privileges as any other citizen, this includes attending a movie. The police officers are trained to handle individuals with disabilities, but these officers apparently forgot about this training (Vargas 2). out. The people continuously adding comments will add what they have heard about this story, this does not mean what they heard is correct. It has been provided in comments on Facebook that Robert had anger issues, but this was not posted in the news reports (Researched By Vargas 2). This allowed people to comment and praise the police for killing this angry, indifferent, and handicapped man. People with Down syndrome are the same as any normal human being. These people sleep, eat, cook, work, and have feelings just like every person that is commenting and discriminating against them daily. Liz Crowter is the mother of a young girl named Heidi who has Down syndrome (Dolan 1). Liz stumbled upon pictures of her daughter as a toddler being used to discriminate against individuals with Down syndrome (Dolan 1). Her daughter Heidi’s photo was used multiple times with different captions. Some of the captions for this photo included “I can count to potato”,“Now I have up syndrome”, and “My milkshake brings all the tards to the yard”(qtd. in Dolan 1). Liz had posted the photo being used on a support group site for parents that had children with Down syndrome (Dolan 1). Liz was unaware that people would turn her daughters picture into a source of discrimination against individuals with Down syndrome. Liz called the West Midlands Police Department to report this incident, but they informed her that it was not an official police matter (Dolan 1). Liz also sent reports to the creators of Facebook and had not received any information back from them (Dolan 2). Many of the people who commented on this article placed the discrimination onto the mother, because without her the photos would not have had a name. Others believed it was humorous and described individuals with Down syndrome perfectly. Heidi is well aware what is taking place with her photo on the internet, but her mother just opened up a whole new way to discriminate against herself and her child with the new photos (Dolan 2). One photo was posted of Heidi dressed as Willy Wonka stating, “Oh, you used the internet to mock people with disabilities? You must have so many potatoes" (Dolan 2). This image included a new picture of Heidi as a teenager. Another photo circulating around social media is of Heidi and her mother Liz with a caption that reads,“Gets offended for becoming a meme, becomes a meme” (Dolan 3). 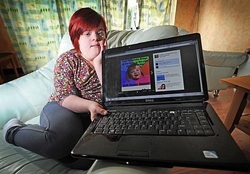 This article portrays how speaking up against discrimination of Down syndrome individuals on social media can cause more discrimination for that individual. Social media is an outlet that allows the users freedom of speech. Even though Facebook has rules and regulations many of them are not enforced. It is stated right in their rules of conduct any images that involve hate speech will be removed. There is a vast majority of hate speech that discriminates against individuals with Down syndrome, but yet social media is still allowing this information to remain on the site. Instead, social media is demanding that a woman such as the one referring to Diana to remove pictures of her child participating in a event. There was not any form of hate speech, violent organizations, or threats being sent out by her photo. It is clearly seen daily on social media that hate speech and threats are being sent out to discriminate against Down syndrome, but Facebook is not solving the problem they are simply encouraging it.